Roads, whether paved or unpaved can potentially harm water quality by virtue of runoff that that deposits road material in the adjacent streams. Problems that arise from degraded driving surface include expensive maintenance and the consequences to streams inhabitants. Potter Conservation District offers funding to restore road conditions that in turn improves stream quality. 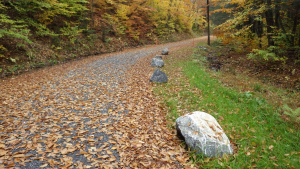 Municipalities, Penn DOT, Game Commission, Fish & Boat, and DCNR are all potential applicants of the Dirt & Gravel/ Low Volume Roads program grants allocated by the Potter CD to improve road infrastructure and the subsequent water resources. For more details about the Potter County Conservation District’s DGR/LVR program(s) visit the policy and applying for funding sections of our website or contact the district at (814) 320-4011.